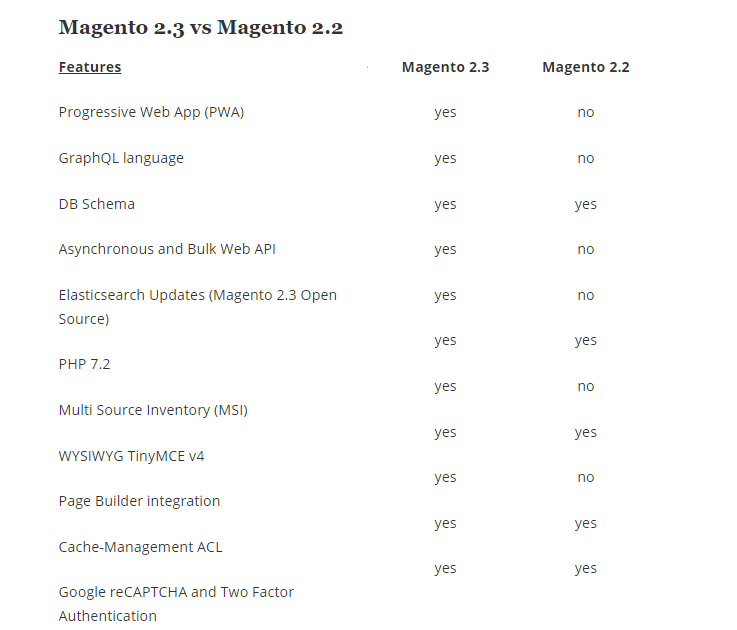 What is the difference between Magento 2.2 and 2.3? Are Magento 2.3 DB schema and coding structure same as compare to Magento 2.2? Are Magento 2.2 extension supported with Magento 2.3? Can we customize own extension in Magento 2.3? Magento 2.3 introduces a new approach – declarative database schema, allowing developers to define database structures and changes in XML files, instead of defining with install scripts. Magento 2.3 will convert the XML schema files into SQL statements and perform them. Not the answer you're looking for? Browse other questions tagged magento2 magento2.2 magento2.3 comparison or ask your own question. Magento2: what is the basic difference between plugin and preference? What is the difference between Magento CE 2.1.4 and 2.1.5? What is the difference between Product ID and SKU? Magento2: what is the difference between container and list text? How to update Magento 2.2.x to Magento 2.3 ? Is it possible to upgrade?